The food coming out of the kitchen at Café Robey could rival any of the dishes from the best restaurants in the city. Here, American comfort food is given the love and attention it deserves with every bite leading diners on an emotional, nostalgic journey. The menu honors the cuisine from every nook and cranny of our butter and salt –loving country while paying respect to those home cooks that made American cuisine the caloric experience that it is. Much like other restaurants in town, the menu changes seasonally with the produce that is locally and regionally available. The winter menu was on its last legs for the year during our visit to the Robey Hotel’s first-floor restaurant but if we had it our way, it would be available all year round. From the East and West coasts, the oysters are a lovely but expensive start to your dinner. 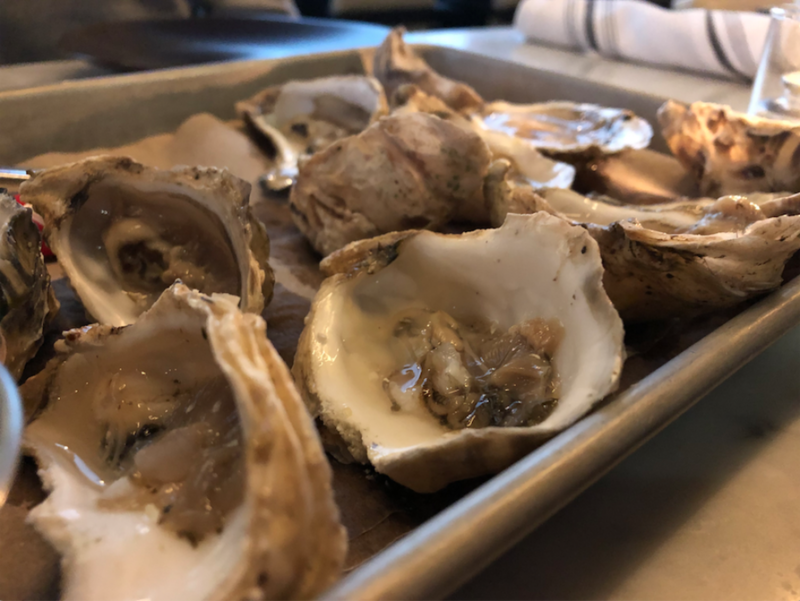 Order a half-dozen ($19) or a dozen ($36) of these bivalves and be sure to use up all of the pickled red onion mignonette it comes with. Or try them with a spritz of lemon and a dash of hot sauce from the cutest bottle of Tabasco for a spicy slurp! If oysters aren’t your thing, then you must order the Fries ($6). To say they are addictive would be an understatement. 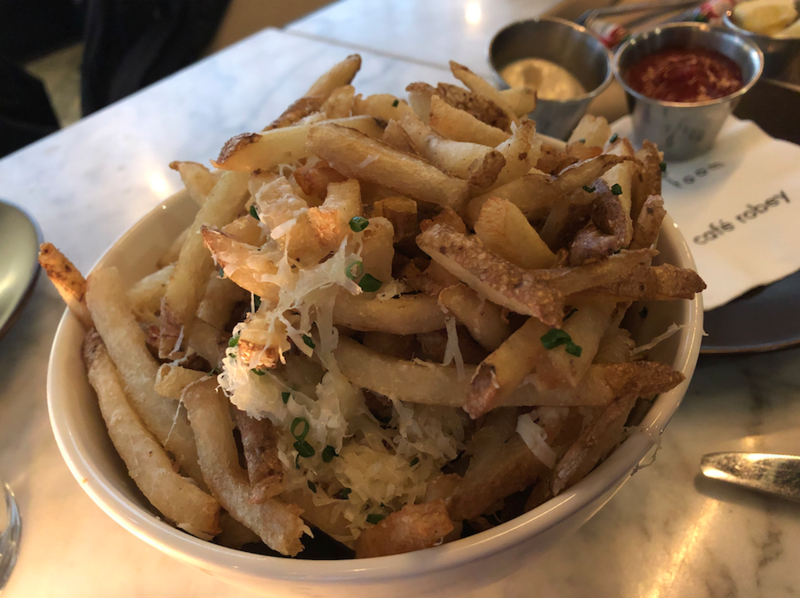 Dressed with shredded parmesan and finely chopped chives and served with a garlic aioli, these fries are so delicious we won’t judge if you order another bowl to share. The Fried Perch ($17) transports guests up north to a Fish Fry Friday night at a Wisconsin supper club. A generous helping of cornbread-battered fillets tower over a moat of dill gribiche-a French-inspired, mayo and egg-based sauce. 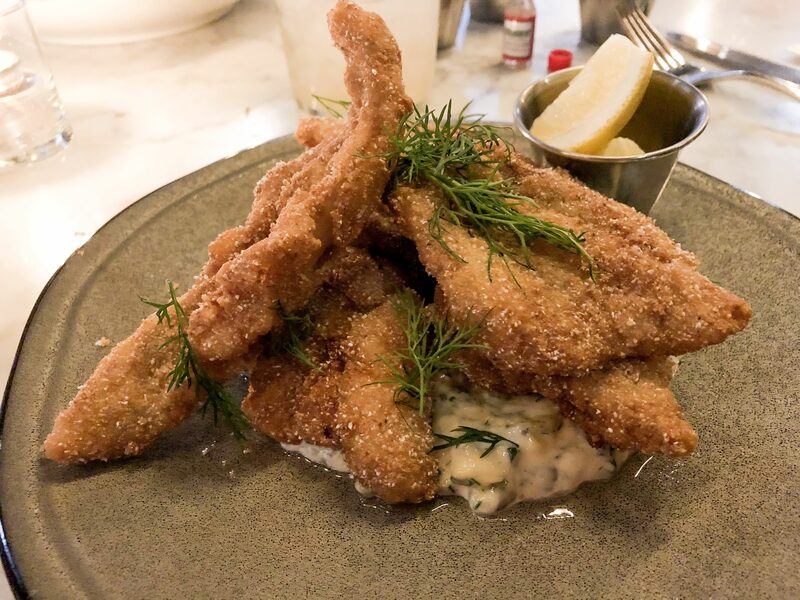 The batter prevents the fish from being overly salty while the gribiche acts as Café Robey’s unorthodox take on tartar sauce that will make you want to lick your plate clean! Growing up in the Midwest, the likelihood of beef stroganoff being served at the dinner table is probably very high. That is why we loved the Homemade Pasta ($17) tossed with short rib and mushrooms. The aroma, flavor and texture set the dish up for a trip down memory lane. 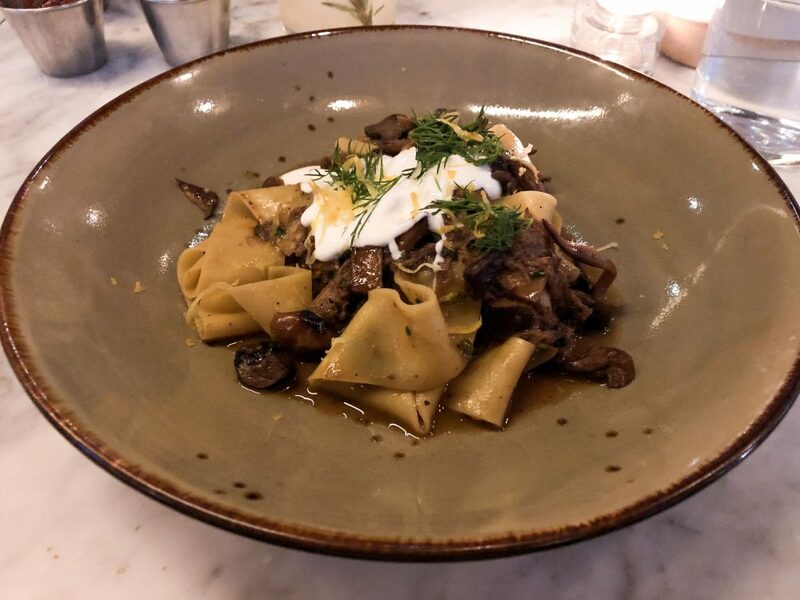 The pasta itself is a thick egg noodle that wraps around the perfectly tender beef and mushrooms as if they were a Christmas present. The city has many places that claim to have the best fried chicken but we haven’t found anything quite like what is coming from Café Robey. Possibly the most memorable dish on the menu, the Fried Chicken ($15 for 2 pcs and $23 for 4 pcs) could contend with any Southerner’s best recipe. The mouthwatering salt and pepper-seasoned skin is gently fried, soft and rip-able but durable enough to protect the impeccably cooked meat inside. 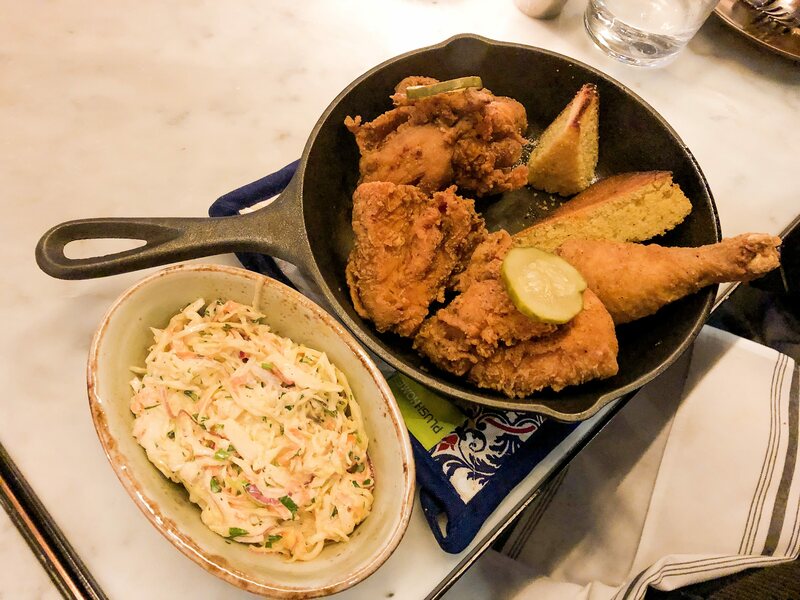 Obligatory slices of cornbread and dill pickle add a pop of color and sweetness in the cast-iron skillet the chicken is served in, joined by a bowl of slightly overly-dressed coleslaw. 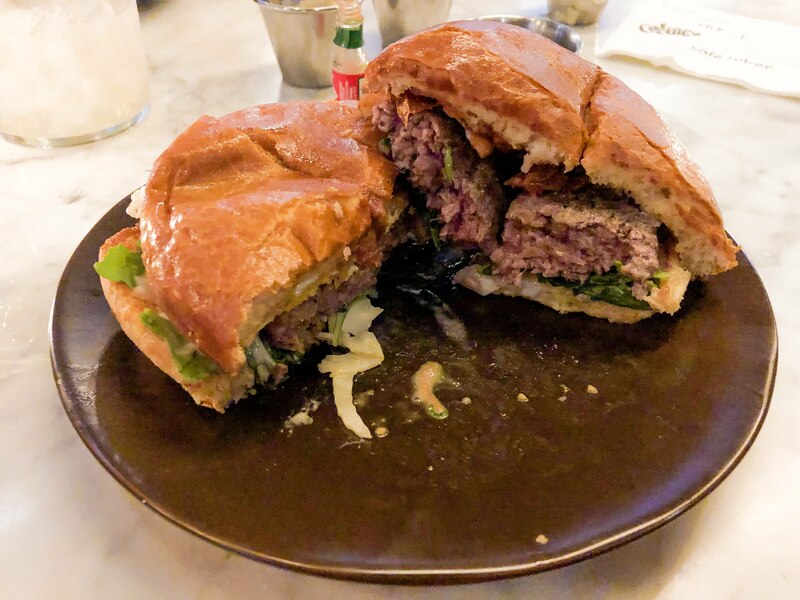 The other star of the meat show is the delightfully gastronomic, Wagyu Hamburger ($16), topped with tomato, fennel, arugula, aioli and a sunny-side up egg between a soft bun. For as delicate as the bun is, it still maintains its integrity amidst the beautiful, rich mess that is this burger. It’s juicy and a little sloppy but that’s what all great burgers should be. 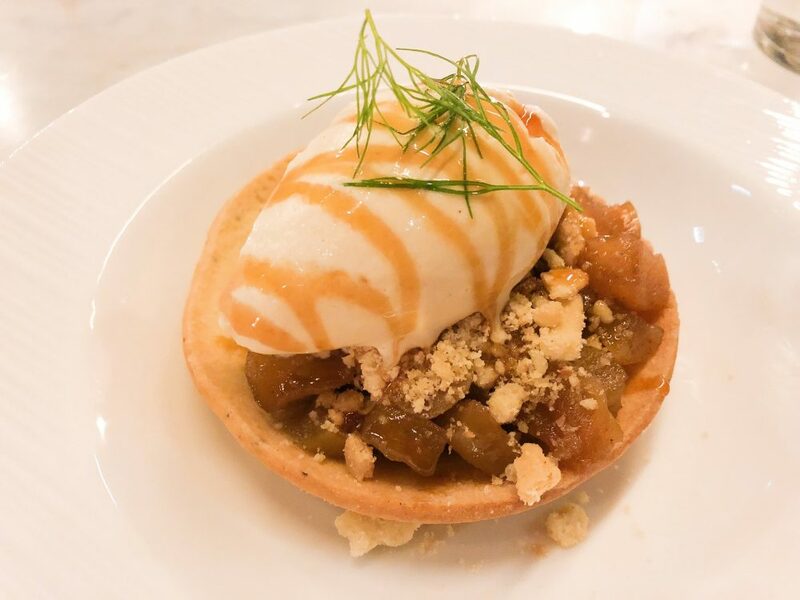 Dessert was the most underwhelming of the courses but still as American as their Caramel Apple Pie Tartlet with Oatmeal Ice Cream! However, if looking to satisfy your sweet tooth, you can take the cocktail menu route. The winter menu features many sweet but light sips (all $13) that pair well with the carb-heavy food menu. We recommend the Sage Advice with tequila, bancha green tea syrup, lime, green chartreuse, and sage; La Dame Blanche with lavender-infused aquavit, crème de mure, orange shrub and lime; Oaxacan on Broken Glass with Banhez Mezcal, house lime cordial and Ancho Reyes Verde Chile Liqueur; and the Blondes Have More Fun with rum, passionfruit puree, vanilla syrup and tabasco. Café Robey is located at 1616 North Milwaukee Avenue in Wicker Park and is open for brunch 7am to 2pm (Saturday & Sunday until 3pm) and Dinner 5pm to 10pm (Friday & Saturday until 11pm).